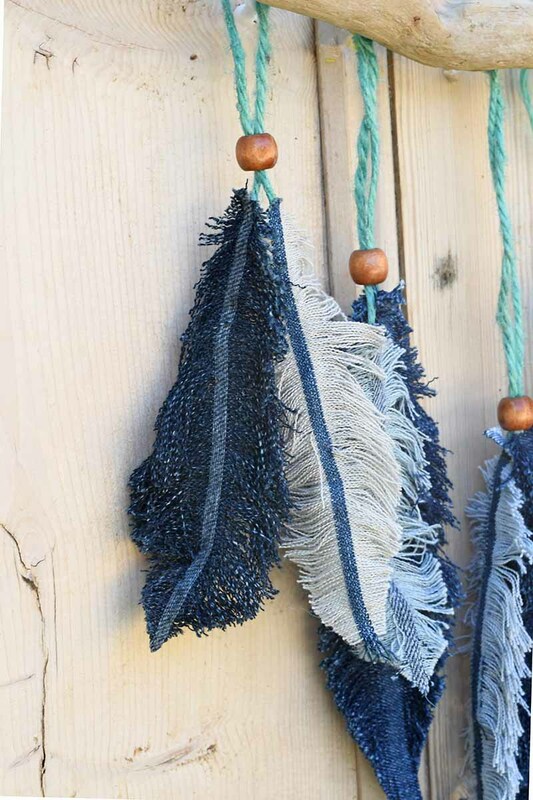 I got the idea for this denim feather wall decor over the summer whilst making denim tassels. It wasn’t a great leap to work out how to make denim feathers from old jeans. The principle was the same as with the tassels. Which is basically fraying scraps of old denim. I just had a few details to work out like the feather spine and shape. 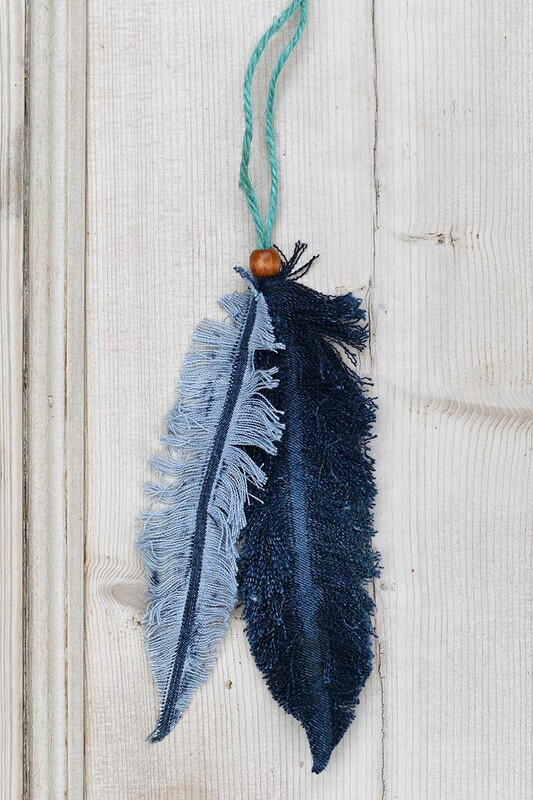 You can make either an indigo or white feather from one piece of denim scrap. The colour will depend on which way you lay the template onto the scrap fabric. Like with the tassels this was a great craft for those of us who find they have fidgety fingers when watching TV. I made these feathers whilst getting stuck into the brilliant Netflix Series Ozark. That’s probably why I ended up making loads of the feathers and hence made them into a wall hanging. 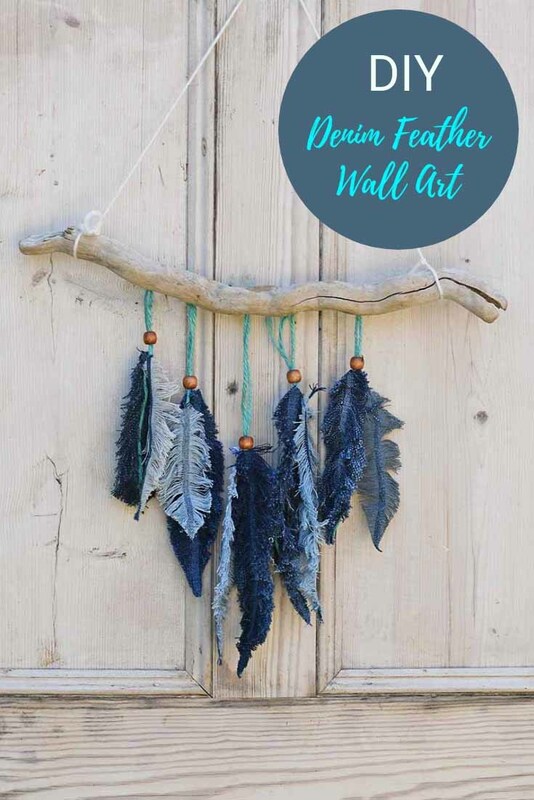 As well as making a feather wall decor you can also use individual denim feathers make earrings, bag charms, and gift toppers. 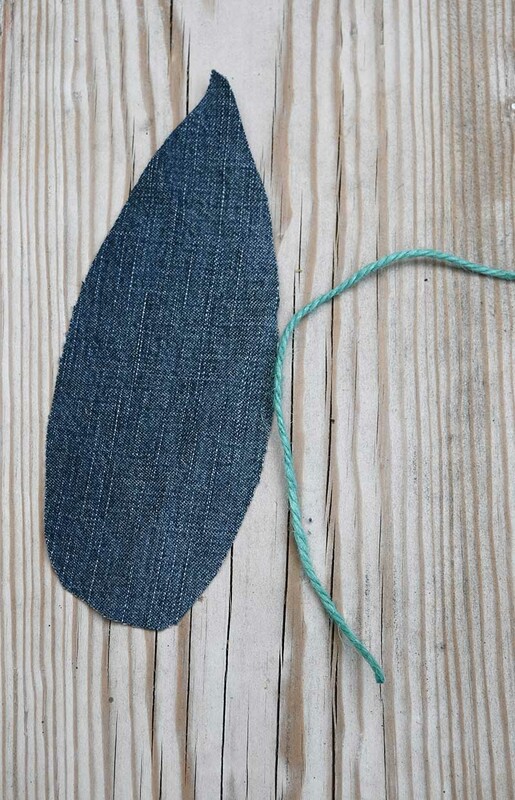 Denim scraps – The scrap pieces will need to be as big as you want your feathers. You will also need pieces of denim with no seams or embellishments just plain bits of jeans fabric. Twine – I love Nutscene twine which comes in lots of lovely different colours. Wooden beads 10-12mm with a 5mm hole. 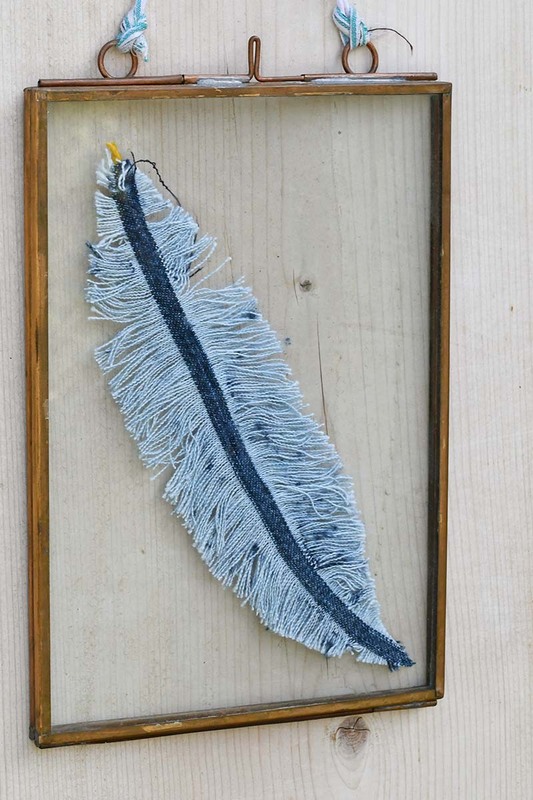 Stick and drawing pins to hang the denim feathers from. 1. 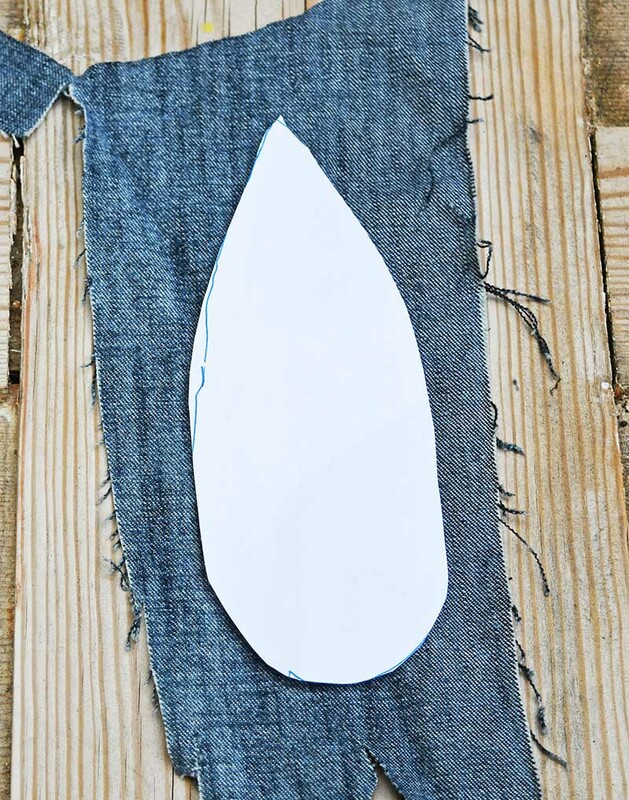 The first thing to do is to cut out a feather shape from your scrap of denim. 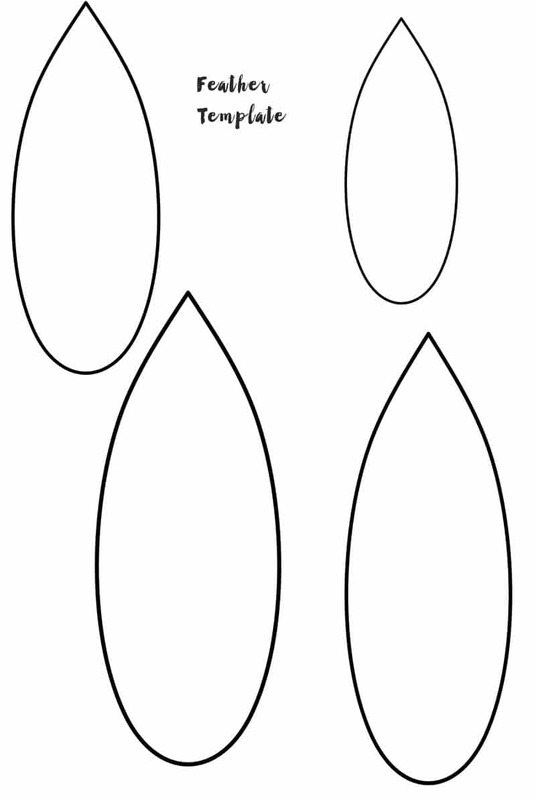 If you are not confident about doing this free hand you can download my feather template and use this to draw around before cutting out the feather shape. Make sure that the template lies in the same direction with the weave of the denim. Depending on which way you lie the feather template on the denim will depend on what colour feather you will make. Denim tends to be made up of a weave of both blue and white threads. 2. 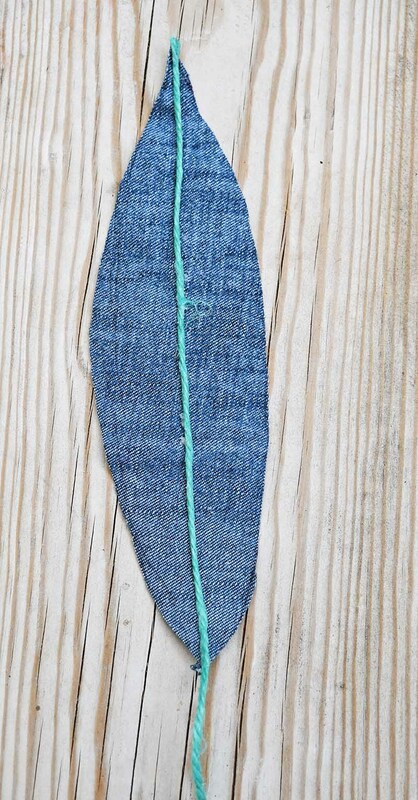 Next cut a piece of twine that is a couple of inches longer than denim feather shape. 3. 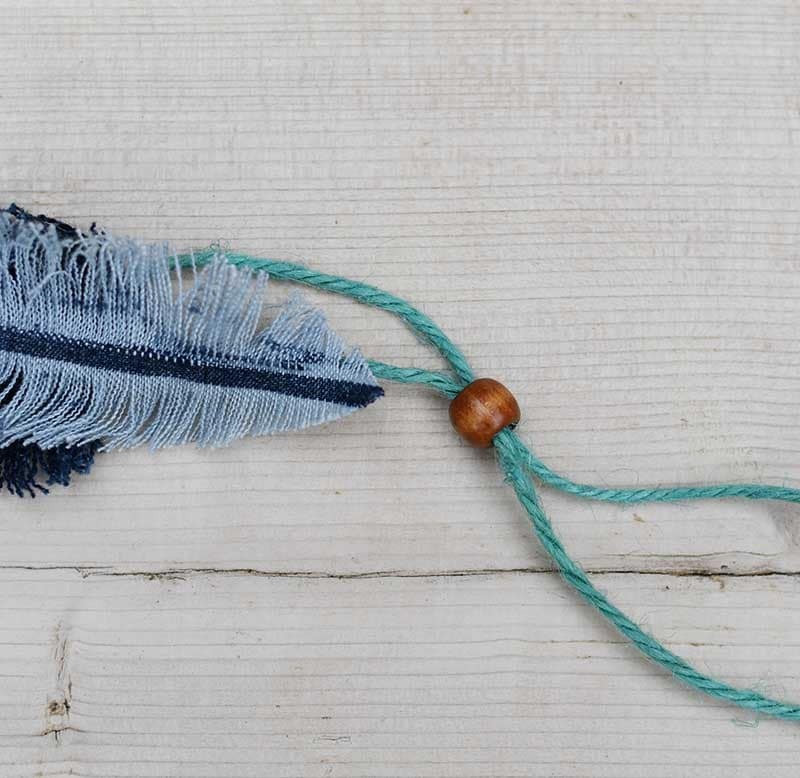 Cover the twine in fabric glue and stick it to the center of the denim feather shape. This will create a spine for the feather. You can stitch the twine in place if you prefer that to glue. However, the glue is better as it also stiffens the twine which helps the denim feather hold its shape. 4. To make the feathers, fray the denim by pulling out the threads. 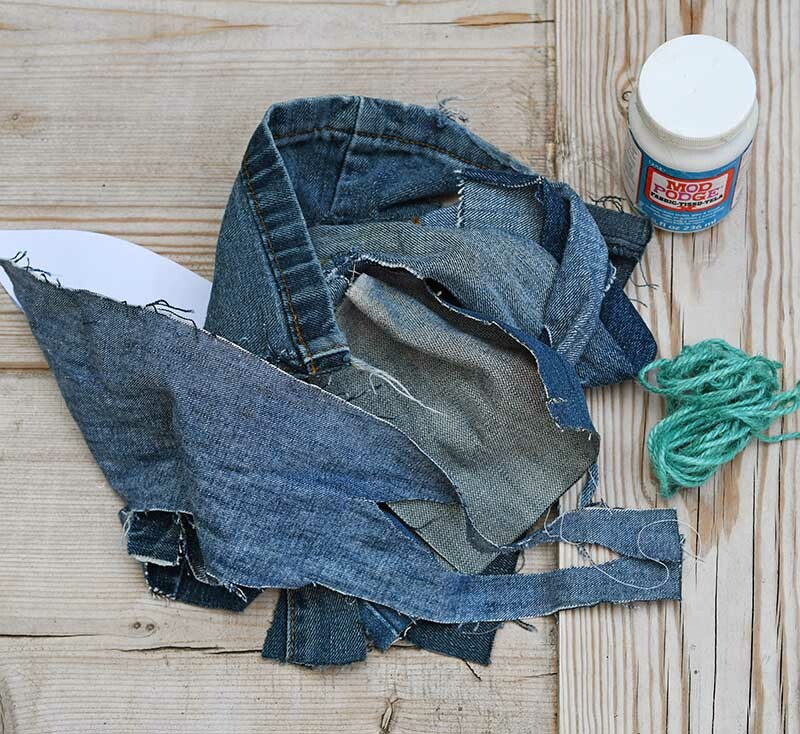 Denim is frayed by removing the threads of one colour. Therefore if you remove the white threads you will end up with blue feathers. If you remove the blue threads you will end up with white feathers. 5. I used this same method to make several feathers, both white and blue in various sizes. 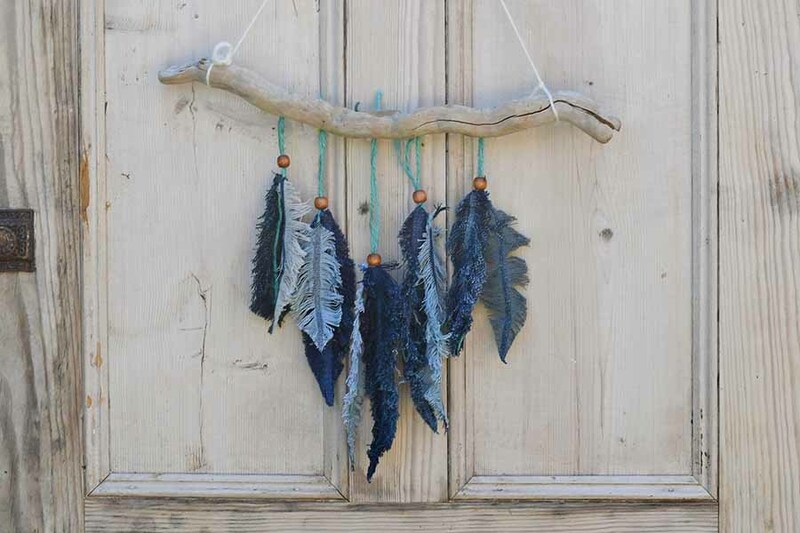 To make the wall hanging, I first threaded the twine of both a blue feather and a white feather through the same wooden bead. 6. 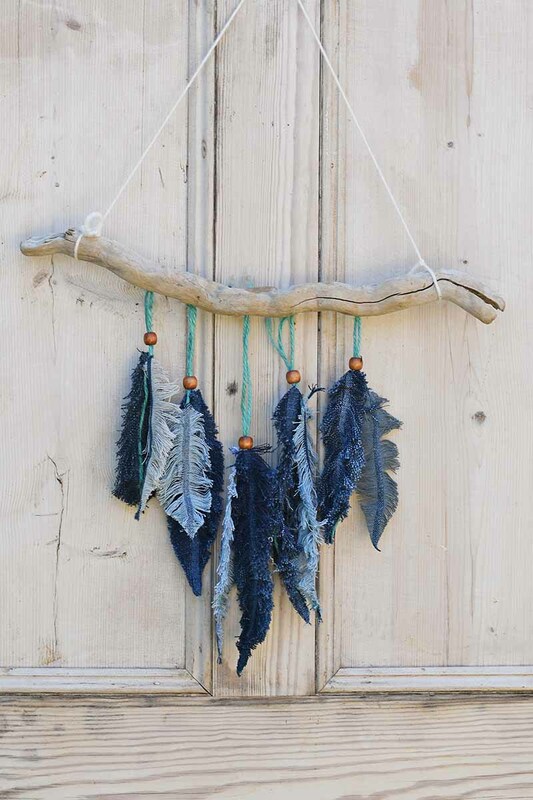 Finally, the pairs of repurposed denim feathers were hung from a wooden stick. They were attached to the stick with a drawing pin at the back. I love how the denim feathers have turned out. 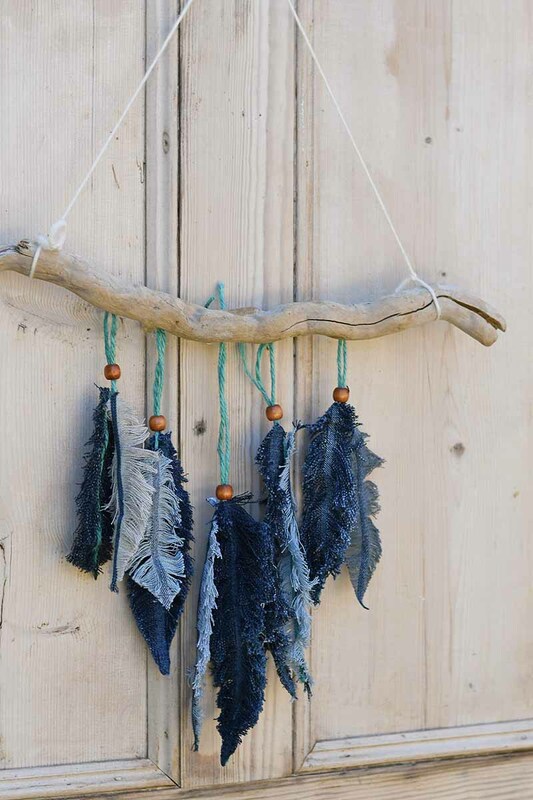 You can make a collection of feathers in different shades of indigo by using denim scraps from different pairs of jeans. 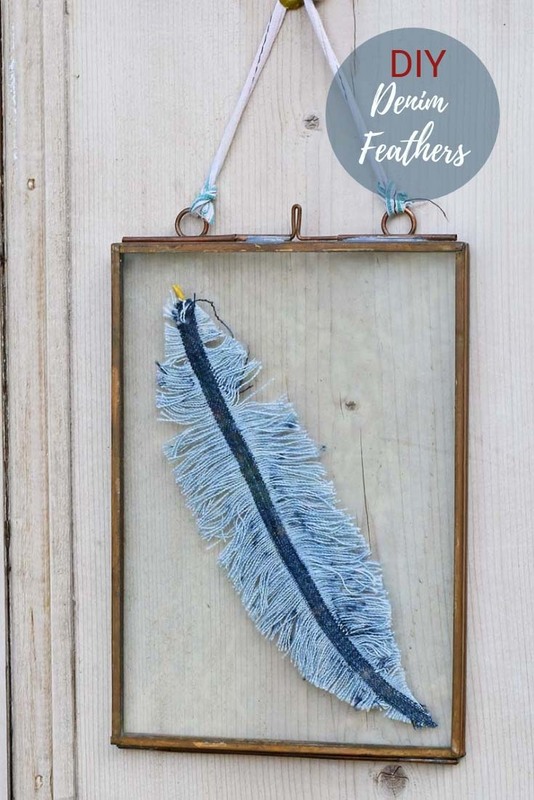 I think these denim feathers would also look great on a cushion or simply hung in glass frames. If you like this you may want to check out some of the other denim upcycles on Pillarboxblue. 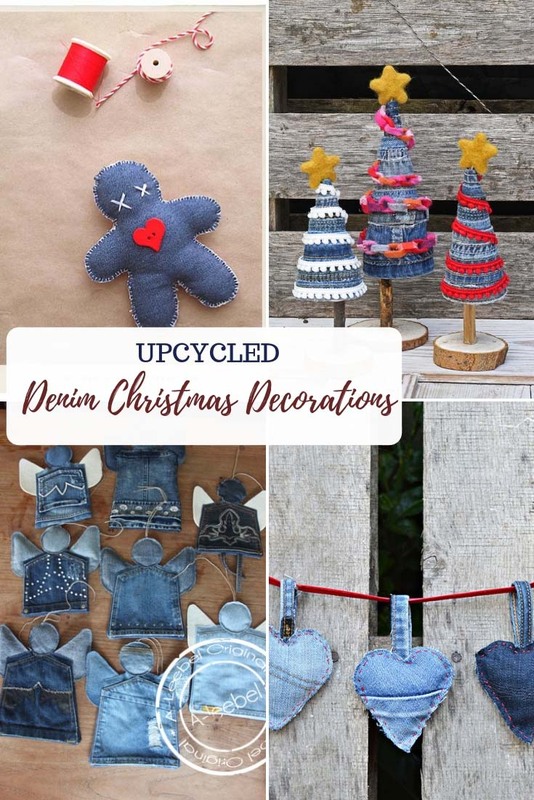 Such as the boho jeans pillow, upcycled denim gift tag, denim tassels, and a cool denim rug. Rub the end between your fingers to loosen the threads. Then grab the thread nearest the cut edge of the fabric and just pull. It should come way. Then repeat with the next thread in line. That’s lovely to hear, thank you. How do you determine if your feather will be white or blue? Mine keep turning out white. If you pull the blue threads your feathers will be white, but if you pull the white threads your feathers will be blue. I am so excited! Thank you so very much for sharing this. I make Frayed denim coats & jackets. These will be perfect embellishments, with a little tweaking for coat application. I will use the heave seam edging that I usually save to braid for purse handles and instead sew down the center of the ‘feather’ shape cut from the pieces that I have left over from my coat constructions. A couple or three of these will look great strung with beads onto a leather strip to sew onto the finished coat. I cannot wait to go out to my studio and tweak a finished coat! LOVE IT! What a clever way to use old denim. So pretty! Thanks for sharing! Thank you, denim is my favourite material to repurpose. Thank you, they are a fun craft to make while tucked up all cozy in front of the TV on a winters night. Ah these are super creative! I wouldn’t have thought to try anything like this. Thank you, yes I think they would look good hanging from a tree. I love these denim feathers! I adore all your denim creations! Thanks so much for sharing at the Snickerdoodle Create Bake Make Party! Thank you T’onna. And I love all your crochet creations I think they are so creative! BEST denim project ever!!! Making as soon as possible! Congrats on blog win. How cute. I actually thought that these were real feathers (dyed of course) before I looked at your actual post. Thank you for sharing at To Grandma’s House We Go. Thank you so much Amy. I’m glad they look realistic! These are wonderful! I love them, and I’ve featured them at this week’s Thursday Favorite Things party. Thanks for sharing! Thank you so much and I’ll look out for the feature thanks. Another fantastic project Claire! Thanks so much for sharing on craft schooling Sunday! Thank you, Michelle. Someone else suggested using the seam I might try it with my next batch. I love this, I’m such a fan of your work Claire! You make such amazing things. Thanks for sharing on To Grandma’s House We Go! Ahh, thank you Chas. That’s very kind of you to say so! What is a drawing pin? A drawing pin is a thumb tack or push pin. I’m so pleased to hear you are making them and having fun. I did thing they would make lovely earrings. Thank you for sharing the tutorial with your friends. OK Claire, this is getting ridiculous, you have to stop making these gorgeous things that I have no time to try myself right now!! I thought the tassels were cute but these are even more lovely if that’s possible! Wouldn’t they be fun on gift wrap? Along with a pretty tag or something. Thank you, Julie. I can’t help it “a makers got to make”. Yes I thought they would make lovely gift toppers too! Thank you, Lisa. They are very simple to make, Ive had the idea for ages but for some reason it took me a while to get around to making them. Now I’ve started I can’t stop. At this rate I’m going to have enough feathers for a Lampshade. 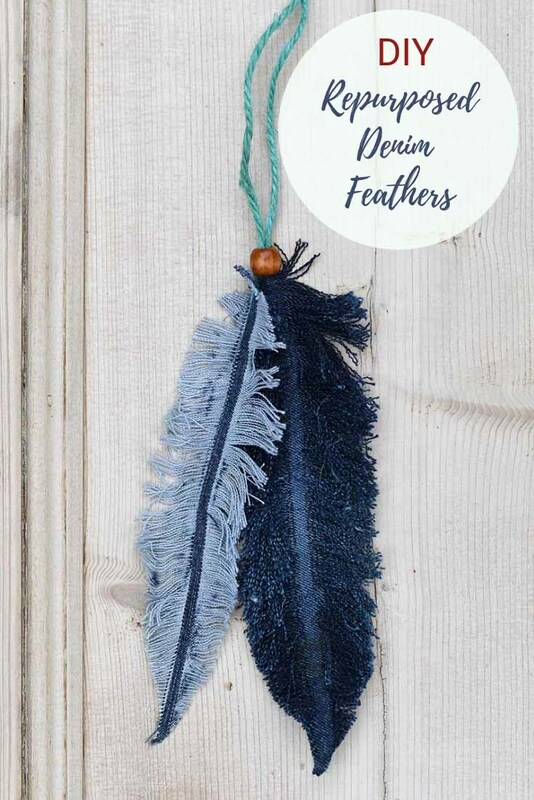 These denim feathers are fabulous! Thanks for sharing at Vintage Charm! Thank you, they are just a bit of whimsical fun. Thank you Lori. Any denim fabric would work. What is the best way to remove the blue or white threads most efficiently? Tweezers? I just pulled them out with my fingers. Sometimes I used a pin to bring a thread to the edge.